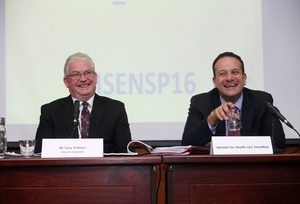 Then Director General HSE Tony O Brien (left) and Minister for Health Leo Varadkar TD at the publication of 2016 HSE National Service Plan in St Dr Steevens Hospital in Dublin. 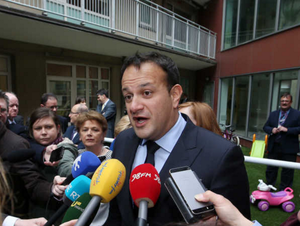 Fianna Fáil leader Micheál Martin, speaking on RTÉ Radio One’s Morning Ireland earlier, speculated that Mr Varadkar, while Minister of Health in 2016, must have been privy the briefing notes, including one from March of that year outlining a ‘communication strategy’ for the media. The Department of Health said no health ministers had seen those memos. 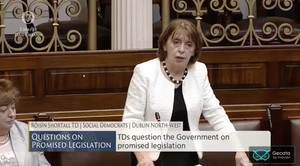 Audrey Carville: “Do you believe that the Minister for health at the time, March 2016. 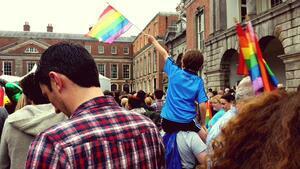 Leo Varadkar did not see this memo? Martin: “find it very difficult to comprehend because in the department’s statement last night it is saying it [the memo] was shared with the acute hospitals’ division of the department and it was shared with the Chief Medical Officer. When I appear in public – say at a Committee I conduct myself against a simple standard. Would I be happy for my children or my mother to see how I behave? I sometimes look across the room and hope their children will never see and hear how they behave. Posted in Misc and tagged Leo Varadkar, Tony O'Brien at 10:07 am on May 11, 2018 by Bodger. Of course it does. Ordinary people are held to account all the time. When you are linked to certain people, you just step between the raindrops. Tony O’Brien presided over a sick organisation and was well rewarded for a performance that might be called, if I am being kind, ”lacking”. Looking at some of his friends and where he going and who is linked to his destination is quite revealing. Ultimately, Tony carried out his role exactly as was requirement by establishment Ireland and was being well rewarded for it. For him to go on Twitter now to complain about committee performances display a level of disconnect that is common across a certain section of our public services and is a real concern. Ultimately, when someone is allowed a free reign without sanction and even protection from the people who are supposed to be representing US, its not hard to understand why people like O’Brien are the rule rather than the exception. Please go away Tony, your attitude stinks and your track record is shameful. He’d have to be a clueless naif for that to happen, so no. the audacity of him. the complete lack of empathy over this whole thing in general. and to think, during it all he was sitting their, looking at the people asking him about this awful tragic negligence, and he was thinking “how do these people look at their kids when they go home?” .. as if its a heinous crime to even question his involvement. utterly horrible, dispicable excuse of a man. sigh. Perhaps, and this is just a random though. Perhaps O’Brien is best placed to know about Cervical Check, and it’s practices, it’s audits, it’s risk mitigations, it’s tendering processes, and also how it has performed over the last 15 years (relative to other countries screening). And, just perhaps, he is confident that Cervical Check will be completely cleared of alleged negligence. oops. hangs head in shame. I think “Cian” actually is Tony O Brien, its the only thing that makes any sense. Its a pity he didn’t apply the same “standard” to how he actually conducted himself in the job…you really couldn’t make this stuff up. But it is ,and its reality. Will we as a nation tolerate this. “Countless scandals?” Disingenuous or Conspiracy theory? Now he’ll be able to utter the words “I can’t recall” without any fear at all at the inevitable inquiry that will take place where no one will be held accountable and a series of “recommendations” are issued and €10s of millions in legal fees clocked up. Onwards and upwards to the next scandal! And already the HSE budget if all these legal cases are included is already spent. And they want a pay rise? As the state is indemnified by the smear test company, these women will face having to take on the US companies as the state hides behind not being able to do anything. These women will be facing going through court, but not by the state.by the US insurers. Perhaps the memo fell behind a radiator. I would say the paper shredder ,and hard drives suddenly are destroyed, wiped. Who can we blame? The Russian hackers. Late nights trying to destroy the paper trail, and the biggest bottom covering exercise. It’s somewhat minor in light of the appalling travesty that’s unfolded thus far but does it bother nobody else that Leo has the handwriting of a sugar-addled child?